Think would be a nice Christmas Card even in these colours. ? This is in Chocolate Bronze and Crystal stocks. It does not shimmer in this picture but had a problem getting the shading to show if in the light the other way sorry. The top layer of chocolate is actually a frame around the picture. Had a lot of fun learning with this picture and am sure will do some for cards this year. 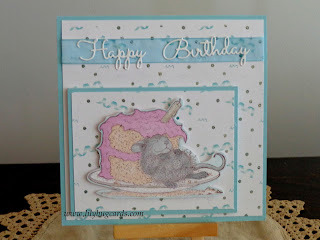 This is another one of the loved House Mouse stamps. Have a whole drawer full of them, and have been having fun colouring them. Thanks to my best friend who gifts me these on different occasions. Well here is a wee guy I love to do, and done when still using markers early in the year. Love doing this one, as a beach if my favourite place of all. Especially if at the ocean or a beautiful large lake. Decided to post a second card from the "Batch" waiting. 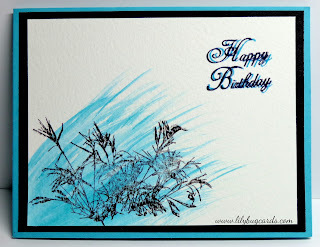 This was one that played around with the few new oxide inks and did a background and then embossed the beautiful stamp and sentiment. This is a bit more of what going for with the pencil crayons, since markers are no longer an option. Had lots of fun and of course did it backwards, doing the finished layer then matching up. Thanks goodness for the Gina K stock still living here. I took the Salty Ocean first, then moved to Peacock feathers, then on to the Spiced Marmalade, and Twisted Citron. Next came my Tim Holts stamping platform. That is the absolute best because of being able to use my clear and foam stamps with one thing and no fussing about to make it work. The floral stamp is a new one from Magenta, and the sentiment from Gina K's old set Springtime Silhouettes. These were stamped with Gina K black ink and then embossed with clear embossing powder. This is where the platform came into play with two different type stamps. Gotta love it. The inside is done with the black layer and sponged layer to match waiting for whatever. Another one done ages ago from Jodi at Bug a Boo. Love her sense of humour, love it and the stamps and used to do lots of them. And of course, love the sentiment on this one. For this one I got out the pro markers and played around and no idea why but nothing is shaded like usual, but that's ok. 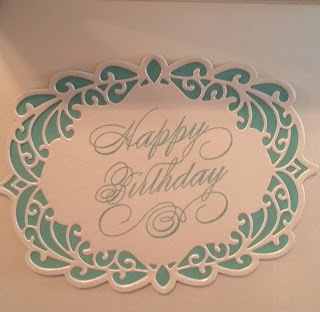 The old regular spellbinders ovals and scalloped ovals were brought out of hiberb\nation and used for this as well as an old SU punch for putting the sentiment on. The edging on the punched stntiment had to be a Tim Holtz colour as don't have the Jelly Bean Ink. Ribbon, again from stash as get a material store. Think this thing with not being able to use markers any more threw me more than thought. Have been busy learning to do things again in pencil crayons and with left hand, so thankful for being amibdextrous. Bit by bit coming back and so time to get some of these cards sitting waiting to get posted up . This wee guy ghas been waiting to get posted for months just like all the others sitting around. My bad !! It was one that was a gift from a friend who always gets me House Mouse Stamps for the occasions. Gotta love it. Done absolutely ages ago for a birthday for one who started me with the pencil crayons, and is into planting lots for the garden. In fact I cannot find the copy that I always do. If dong two at a time, one has to turn out. :) And give me what I used . The stock was Gina K White, Dark Chocolate and Mango, with the DP from Momenta if memory serves. coloured with pencil Crayons, combo of Staedtler and Prisma. Have a super day all. Was colouring again and actually got out the promakers and did this one instead of pencil crayons. Opps. Did use copics for her hair. Had pros on the original done. :) The used the Glitter Ritz on the sand. From The Paper Shelter, it is actually called "Summer Attitude" and comes with a backing, but decided to go the pink route for a change. Then took the coloured piece, cutting to the size wanted since the A2 rectangle dies have done a walk about on me and will show up when they decide to. This of course means getting out the mini perfect layers to do the pink with for under the picture. And of course the pink inside ready for the crystal text to be printed out and adhered to. CTMH Glue for glitter etc. Again from the gifted products from Christmas that have had me playing with pencil crayons, a thing not done for about 50+ years, and having a lot of fun. An 8 x 8 page coloured with staedtler pencil crayons. hopefully goes on the right page now. Again, staedter pencil crayons and from the same book as the first one. Can't believe using pencil crayons again after so many years. Since school. This is a cute one from The Paper Shelter that I have been playing with along with many others sitting here ready to post. No idea why not posting, but hey. She comes with a background but didn't use it and so went with the shimmer stocks again and the pencil crayons. Am really finding that it is more to my liking than the markers in most cases as a softer look overall. This is a 5.5 square card using stardream and neenah metallic stocks and cougar for the colouring as it was the one for markers and printed on it. Since I know a couple of wee gals who love ice cream and hear the truck before anyone else, this is going to one in June. Digital from The Paper Shelter called "Not Enough"
Enjoy and have a wonderful day. This was an invitation done for an "extended" families shower coming up that my d.i.l. is hosting. Though this would help out a bit. The brides colours are supposed to be burgundy, white and Silver, so ran with that. This is the invitation and it is more burgundy in actual than reddish. Took again, the metallics and used the two colours along with a Tattered Lace die for the birds and bow, then a Marianne Border die for the bottom. Next came an inside layer on matching silver text stating when, where and so on, and again did not like the square corners so rounded off two opposite ones only on it, attached to the invites and that was it. Next direction sheets to match and stick inside. Now the next thing was being told that maybe reply cards would be nice, so off I went again with the dies and glue coming up with this. Just due cut the bows, stamped the stamp on and put clear embossing powder on the inked words and heat set. Layered them and then made a silver envelope in the reply card size and that was it. All done. !! Actually the feedback has been good about them, and they really look much better in real, so all is good. Have a good one all and thanks for stopping by. Well. 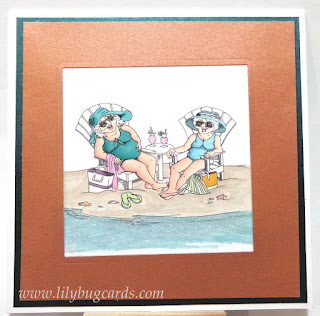 This card was done a while ago and then when adding the finishing touches goofed with the glue, so had to redo. Finally got to it and here it is. Again with my much loved Metallic stock this could be for any romantic occasion. And another 5.5 square. Just love the working room on them as opposed to the A2 ones. Started with the opal metallics and the cut a layer of Coral to play with. The Tattered Lace dies were shouting at me, so got out this beautiful one and cut out two in the opal, and then got out a Marianne Die and did the rings. The ribbon stash came into play again and took the sheer off white to match as close as possible to the opal and attached it, glued down the die cuts, (very carefully this time ) and when done that took the foam tape and added to the back of the coral panel;. Took three bling and attached, and that was it for the front. This is layered inside with the coral again and print out a verse of choice on opal text weight to go over that. Well put this wee guy on a card after playing with pencils again. 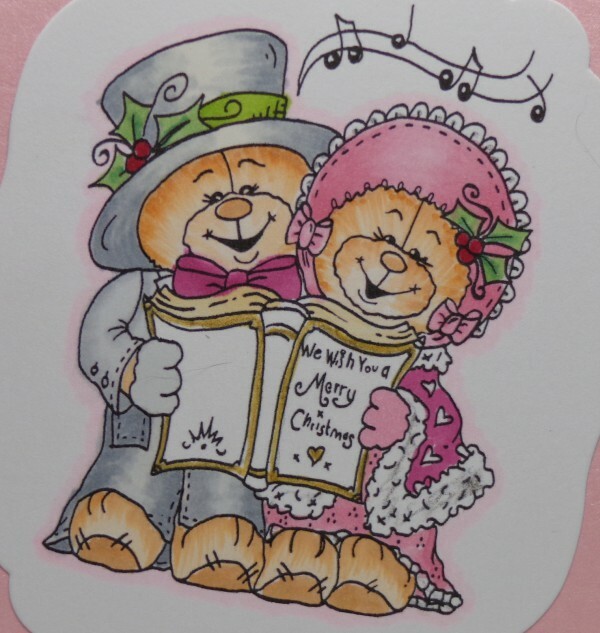 He is an old digi from Bugaboo Stamps. 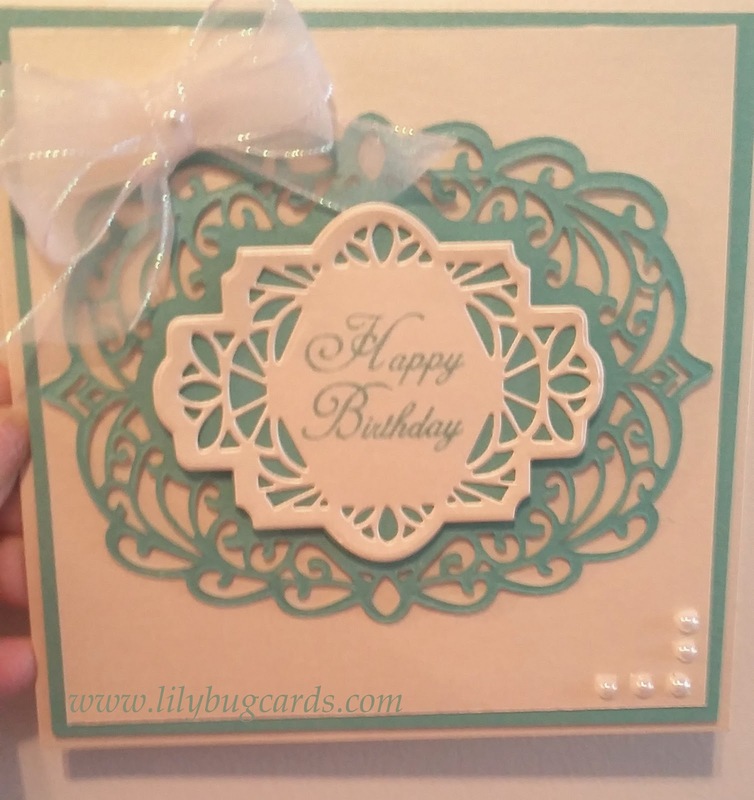 The die cut is on the inside as well and is a Poppy Rectangle die, a Tattered lace edging die, then rounded the corners with a CTMH corner punch. I am really having fun learning yet again with pencils this time, but enjoying it. Have a happy St. Paddy's day all. for Challenge 279 - Winter. Again another one not done for the season but had to do it because these guys are so cute. they have some beautiful digitals and have a few never done here, so have to get busy. Markers: Pros and Copics again mixed. Entered in the challenge posted above in The Paper Shelter. 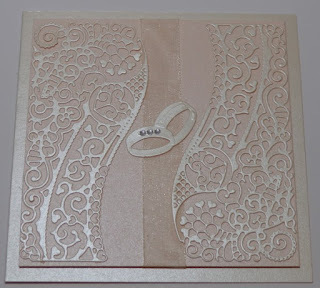 Die cuts for weddings, 7 pix !!. 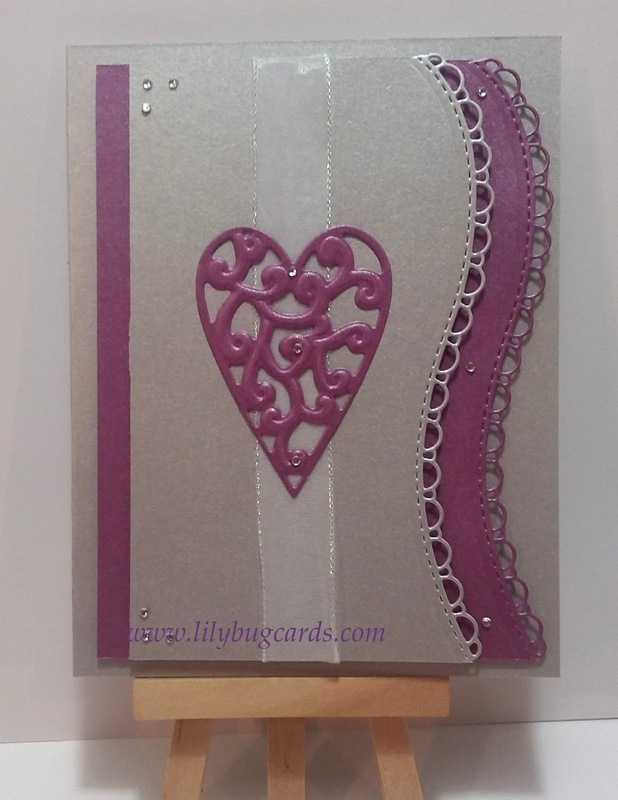 Well, was playing around one day last week with this card and could not decide what to do with the front, so cut all the words had pertaining to anniversary, love and weddings and went to town. So these were the ideas came up with, and some are a bit crooked but every time something was moved to it's exact place something else would move like there was a wee wiggle worm inside the die cut so gave up. Just goes to show what you can do with two word sets and one was an every day one. Go figure. The stock is Stardream coral and opal and the dies are Tattered Lace. That's it. Was pretty happy that all these combinations could be made and know that there are more dies in the drawer for weddings so can do with other things than the birds and rings as well. This was a fun card to do because for a friend who also loves cats. Can post now because she received it. Actually this is one of the first stamp sets from Gina K and of course held on to it in my clean out of lots of items last year. :) It is "Purr-fectly Delightful" and one of the few left of any stamps that is not clear because it is a keeper. This is my way of doing cards. 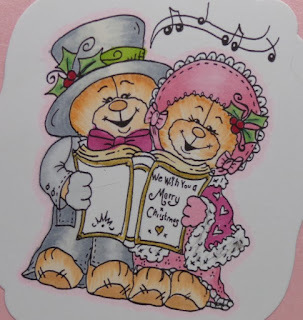 Make a card that suits the person, which is why you almost never see anything in a sentiment on the front of a card till it is required Maybe temp stuck on and that is it. Cougar white for markers as always and the paper is from a beautiful Momenta pad that is almost gone. The Ribbon as always from the fabric store. Wow, can find lots I love to use there. Enjoy and have a wonderful long weekend. Here is one that has been sitting waiting to get posted. Another House Mouse cutie called "Eat Your Cake and Nap Too"
The dots on the digi paper are all done with a gelly roll silver pen to glisten it up a bit with nothing able to be pulled off. She loves sparkle on anything from shoes to bedding, so always have to include some somehow on things for her. It was coloured very simply with Pro markers Pink Carnation , Sand Dune and B000 for the shading. 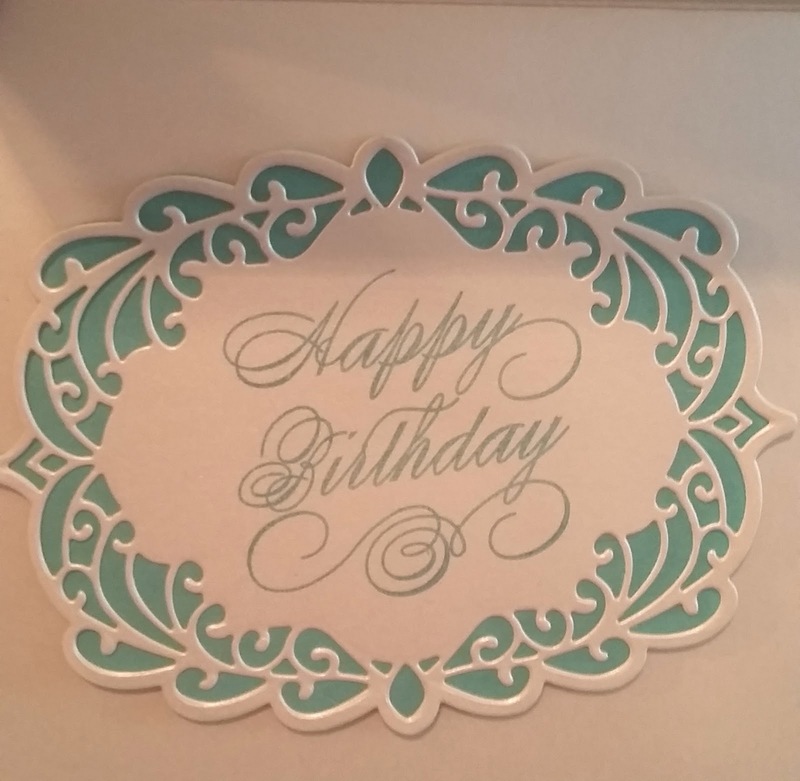 Then cut out and popped on the card. The stock is Gina K Ocean Mist and ribbon was of course from the fabric store again, and then added the die cuts letters that were done with the Tattered Lace Sentiments set. Got the birthday offset a bit. oops. 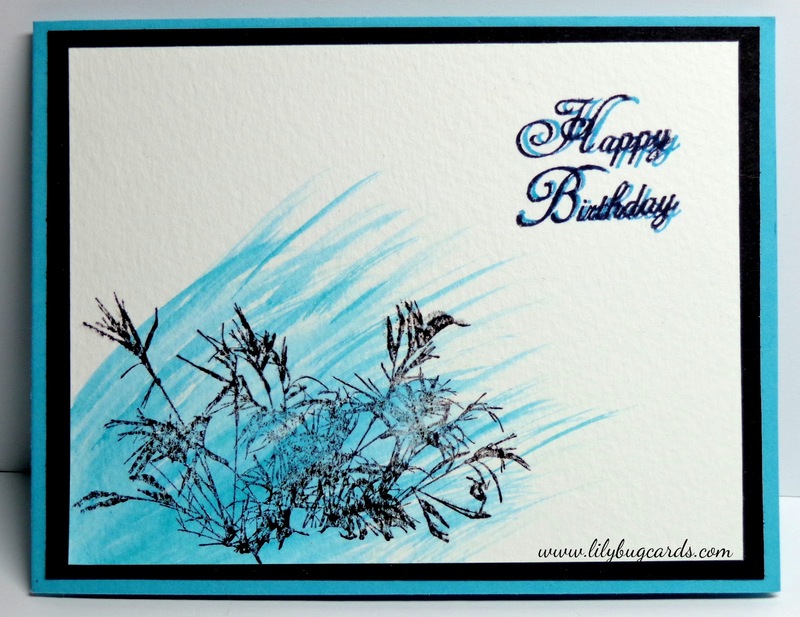 Inside is the layer of paper and the second layer of Ocean Mist with white inset and my message added there. Have a super weekend all and thanks for stopping by. Happy Wednesday all. hope you are having a wonderful day. This is a card done a while ago and waiting for someplace to show itself. The stock is a colour of metallic from Neenah as is the die cut layer. This die is the "Collecting Corners" from Tattered Lace. Just love that on and these cut so perfectly. Inside as usual has the Champagne/ivory colour over the turquoise and ready for a printed verse or sentiment for whatever. A wedding, shower or invitation. Who knows. This is a 5 x 7 just because that is what I was playing with size wise. Could have been a square one and may just try that next time. The stock was Gina K black and silver. Have had the silver for ages. Have Winsor Newton paints and brushes so that is what was used, and then an Impression Obsession stamp with Gina K black ink. The inside will be silver on the black again with the sentiment printed on silver text and added when required. Have a super day all and thanks for stopping in. This card was done because I woke up with the idea for it and no matter what it had to stay as envisioned. Again, for me a plain one, but would be a nice invitation. The ribbon part could be varied. So got out the beautiful black and white and went to work, cutting and embossing. Then the embossing folder is not 6 x 6 so had to work with that and change the design a bit. Gotta find one. Here is the bow part as of course it does not show in a straight on picture. Of course the inside is layered with the white for the metallic paper to go over and a bow from the die is on the top half in white. Square Stone: Close To My Heart. No idea why this colour combo was used, but it came out ok. Note that the tag is not stamped or have die cut words on it yet. As usual saving till needed and it is a temporary clue so can do what is wanted with it off the card. The Die on the right going up and down is the complete die, and the rest wiinging its way in pieces to the left of the card were cut and added. 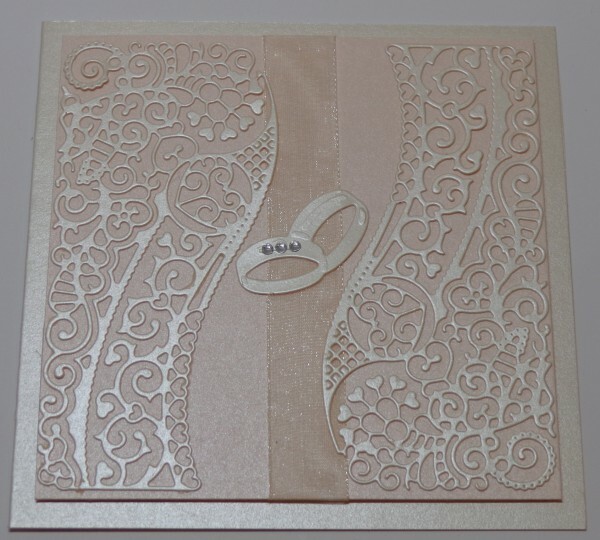 First though it was cut out a couple of times and embossed with dark brown embossing powder to give it a shine. Was kinda playing with the dies that day and seeing what could be made to use and ended up with that. Hope you all are having a super day so far. This card was so much fun to do. And of course had to find a challenge or two to put it into. Am a person who loves all little "critters" so you will probably see lots of them and florals here if you have not visited before. Seem to be doing either colouring/watercolour or just dies, and think that it will stay that way. Stock: Gina K White and Lemon. Love that colour. DP : Magenta from a pad a couple of years old. Ribbon: As always from the material store as buy lots at a time so don't run out in a hurry. Cardsundmore: Challenge #159 "lets use lots of colour"
Creative Craft Cottage Challenge #64 "include an animal"
Today is a card with a stamp that has lived here a while but could not decide why I bought it. Ever do that one? Anyways, dug it out and did not like the finished product whole so cut it down and did a layered Anniversary card in the A2 even though the stamp will do a 5 x 7. This was embossed, then sponged in the flowers and leaves randomly with three colours of ink. Next to decide what to do as did not like it plain so made a bow then cut out the Happy Anniversary out of an opal stock but it did not show so played about and sponged it as well. The inside will have a silver stock and text paper with a printed verse (have so many on here and that is why you never see an inside stamped unless required.) And the die cut on the left inside sponged again. Stock : - Old pearlized stock ?? Stamp: Penny Black - "Glory of Modesty"
Well, this is for a couple of challenges again. Another one coloured and never had a home. :) Still have a pile but keep doing more anyways. Now that I have all the stock in one place and see how many hundreds of sheets that were hidden ???? Have to tell you, the colours picked themselves this time for sure. This one is a fun one to colour and tried new colours for hair, so just bear with me as I learn more than what got into a rut doing. DTBST#334 - Sassy Designs To use a sentiment. Well. Was surprised to find a site for Masculine cards as well as one with that as their challenge theme. Fit right in with the new stamp that had been looking for ages for as have "riders" in the family. Gotta love it. !!! Stamped the stamp with my momento ink and found it not looking good, so got the Gina K black off it's shelf and what a difference Actually was "Black" Wow. Impressed. Now for anyone else would have put a black layer then white then the dp or black card and layers popped, but being for a completely not into fussy person held back completely. For this person this is fancy. Was a challenge to do this way, so may just have to do another one differently to keep the creative side of me happy. DCWV DP from an old pad from ?? I always cut them into 6 x 6 because the fit in the bin instead of in the pads so sorry no idea which pad. The inside is black on the white stock, white stock edged and strip of the dp down the left side. Have been having such fun making cards again and have a whole page full listed to be posted so actually may hit more challenges. 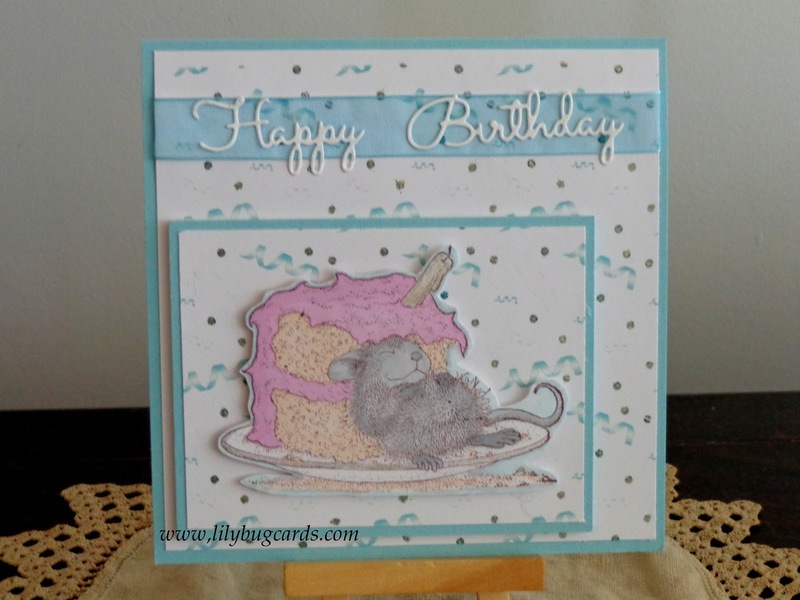 Today's card is another cutie from House Mouse in the stack that I got at a garage sale. Isn't he adorable. Need more mouse colours for sure,. 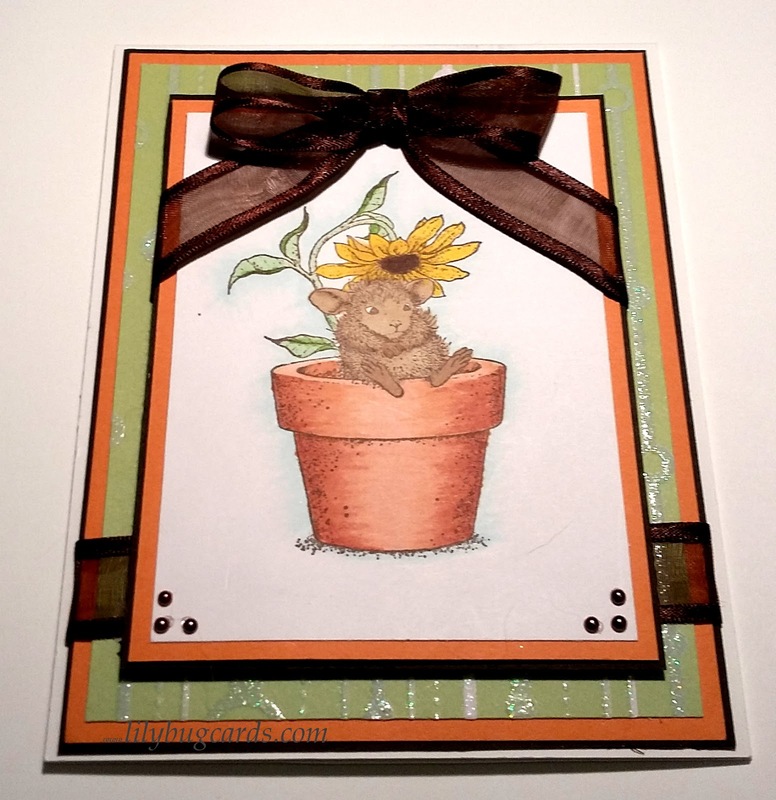 HouseMouse #219 "You Are My Sunshine"
This is not fancy as wanted the flowers to be the focal point of the card. Ribbon, Stash and coloured with Tim Holtz Victorial Velvet as well as the white laye edged with it. That's it. Hope you all have a super day and thanks for stopping by. Tuesday Throwdown #292 "Welcome Spring"
This one was actually one of the "plain" ones done before the large poppy one posted yesterday. It was using watercolour pencils instead of markers, and found it fun. Extremely plain, but then some like that. Should have maybe done some shimmer paint over some of the flowers, but that gives me something to try on another one. The stamp is a digital that have had for a long time from Buddly Crafts by Pachela called "Flower Emporium"
It could have a wee label or die cut on the bottom angled with something on it when the occasion arises. You all know I don't generally put anything on them until ready to use as have been caught having the perfect front for someone and the wrong sayings on it. Stock: Gina K white and lemon. Love the colour of the lemon and have been saving it. Will just have to find a way to get it again if use it all. Pencils: Stadetler watercolour pencils but did not use a brush this time. Hope you all have a super weekend. 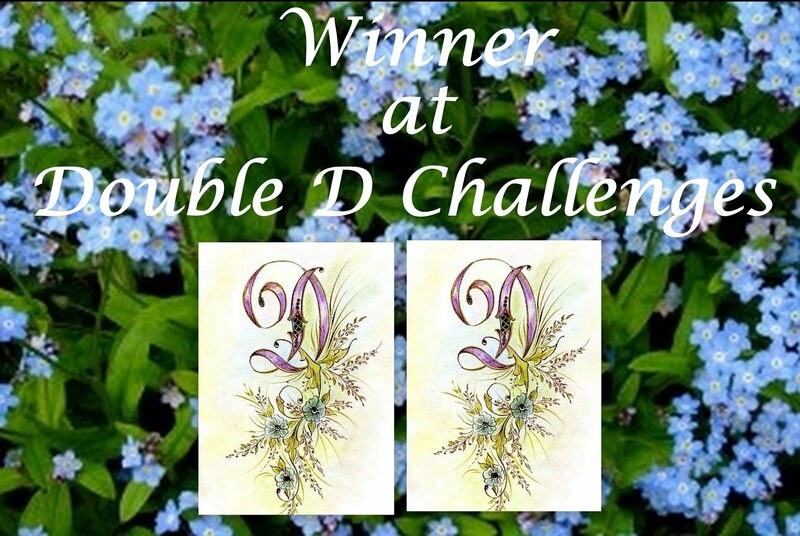 Found a challenge where if not posted before going live one can enter the challenge, so am entering the firs one in so many months cannot remember. Had to post this one as love these to colour when in a whimsy mood. She suits last week when a friend and I went to a store "garage sale" and then a stamp store and had a wonderful time as usual. It can get pretty dangerous when we are out so kind of don't do it too often and then that also makes it more fun. She is from Bugaboo and one that have had for a few years, coloured before and not used. Gotta love her, but nope, did not use plastic, but had to put the caption that came with it on as well. Well, played around again as keep getting told people cannot see where to comment, so hopefully this setup works for everyone. No idea how many have tried now, but that's ok. This is a large stamp from Penny Black that I love. So a 5 x 7 card. Love colouring and when able am going to just colour and get a bunch made up ahead and to other types when not able. Then you may just see some postings regularly again. Sorry for being so rotten at it lately. Hope you like it and thanks for stopping by . Finding a sentiment for it is alway something I decide not to do until whatever the card is required for but it looked so bare that did a temporary one with a SU punched oval and Close To My Heart sentiment from the wee set called "A Quick Hello"
This way it can be removed and what is really wanted added. 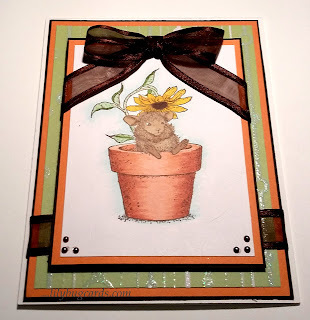 The inside is layered with a sponged layer and ready for a sentiment layer over that. 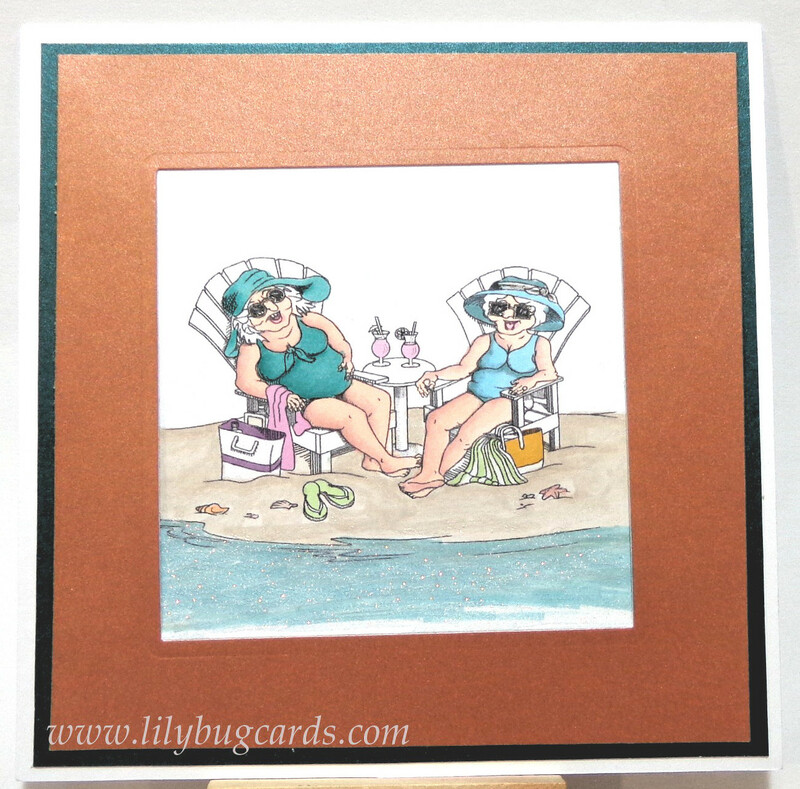 Thanks for stopping by and looking at one of the plainer cards done again. Did 4 in two days, so still a couple to post. Finally, another card. And surprise absolutely plain. !!! This one was a day where four cards got partially made and then put away for a few, then went back and finished them all yesterday. This beautiful digital is from Fred She Said. They have the nicest stamps and as love florals but generally do not find many actual stamps went hunting one day and they have absolutely oodles. Yes, to go with the rest of the week, it is a bit off center, so just remember where it is coming from. The painting was done with Tim Holtz Peeled Paint, Picked Raspberries and Shabby Shutters on watercolour paper. Have a large folder with many dividers in it with Bazzill stock purchased a couple of years ago and never used, as found it too thin for an actual card base, so put away, That said, whatever the colours are called have no idea as they were a couple of packages of 100 mixed colours. Going to use for layers as there are some really pretty colours. Of course the foam tape for popping the top layer, and terrifically tacky red tape as usual and the inside to match. 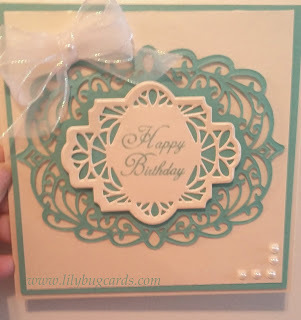 Really felt like making a card yesterday for a change and so got out new dies and a coupe of colours that generally are not used and played. Here is the result. Then took another Marianne die set of three hearts and this is the larger one, some silver shimmer ribbon and went to work. The punch an silver border pieces are on foam tape to pop them and the embossed die cut heart glued in place over the ribbon. Too plain - so out come the wee bitty bling again and put a dozen on it in total, but so tiny that's ok. Inside the next heart is in the middle of the left side with the right left for the personalization over a punch colour on the silver. Die cut border of course. Thanks for stopping in and have a wonderful weekend. This is one done a while ago . and, because not having a printer that worked so could not print off a custom verse did the inside below. Think it is time to put the coloured items on actual cards an get them posted a have actually been doing that again.